It is an age of exploration. Of resources, skills and ideas. New tools are creating important innovations in art, architecture and design. Adaptability, responsiveness, and customization are key values in this technological change. 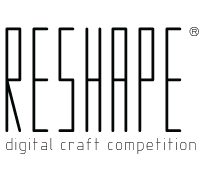 Noumena Architecture, in collaboration with Advok communication, launches RESHAPE® a competition of computational design and digital fabrication focused, in its first edition, on the theme of LIVING space. RESHAPE® is a platform for dialogue between visions and reality, dragging new ideas in the most cynical arena. The Market. RESHAPE® is a challenge for designers, architects and makers. They are looking for innovative projects, characterized by performances, manufactures and costs. The topic of Living present several challenges that can be reshaped by designers. Proposals can follow different directions, but all ideas have to present a clear fabrication strategy, taking into consideration economic and production aspect. All technics must be connected to the use of digital machines such milling, 3d printing and laser cut machine. The scale can vary from small to large size objects. This is a digital competition; hard copy proposals will not be accepted. The language of the competition is English. All entries are to be submitted via email on/or before midnight Jannuary 31st, 2014 Paris Time (23:59 CST). Board size is set at A3 format. Please do not exceed 5 presentation boards set in landscape view. Board resolution must be 150 dpi, RGB color mode in JPEG format. Entry identification code (which was generated during registration) must be positioned in the upper right corner with required dimensions of 40 x 10 mm. No other forms of identification permitted. Disqualification of entries may occur if the guidelines are not met. Entries are encouraged to include all necessary information to clearly explain the proposal. The choice of the graphic representation is completely open to the entry team. A 500 Word Description has to be included in one of the panels.